Eight people gather in a tavern, swapping stories and preparing for adventure. It’s not clear why they’re traveling together—there’s a pious cleric and a murderous dancer in this odd crew—but they’ve united nonetheless. As they wander across the world, each of these people gets their turn to take the reins. In one city the hunter will continue her desperate quest to save her master; in another, the merchant will hustle her wares. Urgency is irrelevant. It doesn’t matter that one woman is racing against time to rescue a kidnapped family member. When the scholar wants to hunt down a missing book, she’ll happily come along. She won’t complain. She’s just there for the ride. Some of these stories are entertaining, others trite, but they’re always independent. They never intersect or share common ground. To buy that these eight adventurers would team up, putting aside their own motives to help each other out, requires a suspension of disbelief well beyond what most video games ask of the people who play them. Why would a hardened thief spend so much of his time hanging out with a goody-two-shoes healer? It’s never quite explained. 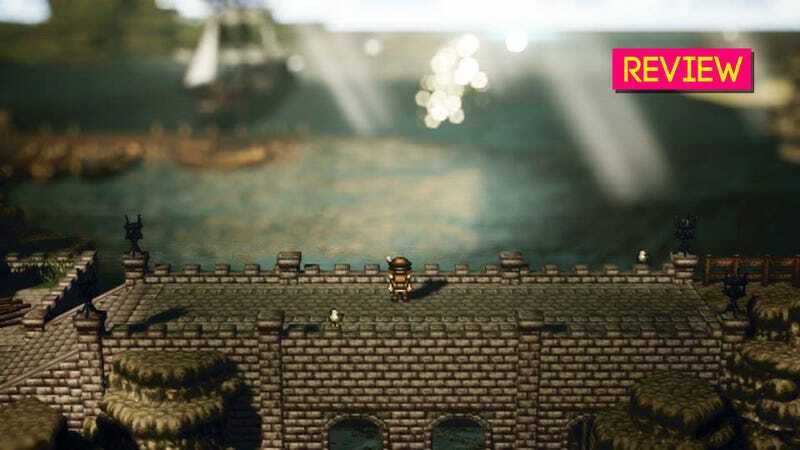 Octopath Traveler feels disparate and unsettling, like someone took out pieces from eight different Lego sets and stuck them all together. The game is not elegant enough to make up for that. "They should've stuck with Quadpath Traveler"
Octopath Traveler, out Friday for Nintendo Switch, is designed to be a callback to old-school role-playing games. With sprites inspired by Final Fantasy VI and a structure reminiscent of SaGa Frontier and Live-A-Live, this game has been eyed as a holy grail for anyone who misses the golden age, the days when developer Square Enix pumped out classic after classic. Indeed, it’s got everything you might expect from a turn-based JRPG: levels, side quests, character classes, a variety of items and equipment, and so on. The first thing you’ll notice is the production values, and there, Octopath Traveler never stops impressing. The soundtrack is stellar, full of piano and horns and pennywhistles, and it all looks gorgeous, as if Square’s artists from the 1990s had never stopped sharpening their pixels. Plastering two-dimensional sprites on three-dimensional backgrounds, the game is full of eye candy, from endless deserts to snowy fields to one very familar-looking opera house. Yet Octopath Traveler is shallow, disjointed, and unbelievably repetitive. The combat system is excellent, which helps keep the game enjoyable even through its grindiest moments, but even that can’t mask the game’s many structural flaws. The game consists of eight standalone stories about eight different characters (hence: “Octopath Traveler”). Each of these stories is four chapters long, making for a total of 32 chapters. Thirty-one of these chapters follow the same pattern. You enter a town, watch some cut-scenes, talk to people in the town using your character’s Path Action (more on that later), watch some more cut-scenes, go into a dungeon, and fight a boss. Then the chapter ends. All of these dungeons also follow a pattern. There are around 50 dungeons in the game, some optional, and every single one is identical: There’s one main path, and then there are branches that lead to treasure chests. Sure, the aesthetics will change—maybe you’ll descend the depths of a sewer, fight through a haunted forest, or explore a mansion—but every dungeon in the game has the same structure. Once you’ve played through one of these dungeons, you’ve seen them all. Even some of the bosses feel like clones. Each of the eight Chapter 2 bosses, for example, stands next to a pair of minions who must be destroyed before you can damage the boss’s weaknesses. This is less interesting the sixth time it happens. What makes this structure even more tedious is the grind. Every chapter has a “recommended level,” gating you off until your party is strong enough, which essentially stops you from powering through each story one at a time. You’ll probably need to grind a little bit no matter what. Problem is, only your four active party members get experience. Anyone you’ve recruited who’s not in your party will just sit in the tavern, unleveled, waiting until you’re ready to help them find treasure or save their loved ones or whatever else. And they won’t quickly gain levels to catch up to the rest of the party when you beat a tough enemy, like characters might in a Suikoden game. Leveling from the 20s to the 40s will always be a sluggish process. Thanks to these level gates, finishing all eight stories is a chore. You also can’t feasibly play each story in linear order because of the level requirements, so you’ll likely switch off as you go, which means you lurch from one storyline to another. It’s not that Octopath Traveler’s stories are particularly hard to follow, as packed with clichés as they are, but each chapter of the game introduces a handful of new non-player characters. Many of those NPCs look the same, thanks to the game’s wonderful but indistinguishable sprite work. The game offers a story refresher at the beginning of each new chapter, which is helpful, but it’s hard to even remember everything that’s happened in all eight stories, let alone stay emotionally invested. [UPDATE (7/13, 5:30pm): A day after publication of this review, we discovered the hidden endgame boss gauntlet. Read more here. During each of these stories, the game pretends that nobody else is around. You’ll only see the hero of any given story in cut-scenes, which is jarring when you know they’ve got a full party with them. One late chapter’s scene, for example, features a dramatic turnaround where a villain escapes after gravely injuring the main character. For Octopath Traveler to ignore the three other characters—who are following that main character around and participating in every battle—is hard to get over. Why couldn’t one of them stopped the villain? Your party members can interact during optional Tales-style vignettes between cut-scenes, but they’re insignificant, just there for flavor. As you’re progressing through each main story, the party won’t talk. Most JRPGs ask you to suspend your disbelief in some way—sure, you can fly around the world raising chocobos even though a meteor is about to destroy the world—but Octopath Traveler takes it to an extreme. You have to spend the entire game not only buying that a noble cleric and honorable swordsman would hang out with a nasty thief, but that they’d participate in his heists. You have to buy into a whole lot of narrative decisions that simply don’t make sense. It may sound at this point like I hated Octopath Traveler, but in fact, I enjoyed most of my time with it, for a simple reason: The moment-to-moment gameplay is actually pretty great. That’s all because of this game’s strongest element—the combat system. Every fight in Octopath Traveler takes place on a turn-based battlefield, with your party on the right and enemies on the left. You’ll see the turn order on top of the screen, while underneath each bad guy you’ll see a row of weaknesses, displayed at first as question marks, alongside a shield with a number on it. Every time you attack an enemy’s weakness, be it a weapon type (swords, staves, bows) or an element (fire, water, darkness), you’ll knock that number down. When it hits 0, you’ll get a “Break” and that enemy will be stunned, costing it a round in combat and making it vulnerable to all of your attacks. You can also use Bonus Points, sort of like the Brave ability in Bravely Default, to give each character multiple physical attacks or augment their skills’ strength. Every character will gain BP on every new round—except for the round directly after they’ve used a boost. This leads to a constant stream of interesting decisions. Do you want to use your two bonus points this turn to finish off one enemy or wait until the next turn, risking that you’ll get hit, in order to have three bonus points and use an uber-powerful special attack? The system gets more complicated as the game goes on, and in action, it feels fantastic, adding strategy to even the most insignificant battles. You can’t just mash A and call it a day; enemies with their shields up are strong to most of your attacks. You have to guess their weaknesses and act accordingly. Octopath Traveler’s many bosses add more wrinkles to this system, sometimes locking off their own weaknesses, boosting their shields, and doing other fun things I won’t spoil. The key to beating the game is figuring out optimal strategies for each one, taking advantage of your characters’ skills, boosts, and buffs and debuffs to do as much damage as possible. As you reach the fourth and final boss in each character’s story, you have to know the system cold. If you waste a turn or make a wrong move, you’ll probably lose. Tressa’s story is the best of the eight tales, although none of them are particularly great. There’s also a light job system that allows you to equip each character with one of 12 jobs (eight based on the main characters, and four optional super-jobs that are guarded by uber-tough bosses). These dozen jobs allow your characters to equip additional weapons and skills. So if you’re leaving Therion the thief on the bench, you can stick the thief job on the warrior Olberic so he can use those powerful debuffs. Or you can transform the apothecary Alfyn into a way better healer by giving him Ophilia’s cleric job. Experimenting with these combos is fun and rewarding. Octopath Traveler’s other systems are also fun, if shallow. There are tons of side activities, though most of them are tedious fetch quests that offer little reward. (Inexplicably, these side quests don’t offer experience, only gold and items, which is too bad—they could have been a nice way to mitigate the grind.) Almost all of them require you to use one of the eight characters’ Path Actions, which are abilities they can use outside of combat. For example, Therion the thief can steal items from NPCs. Ophilia the priest can use “Guide” to recruit an NPC to the party, allowing you to summon him or her for temporary help during combat. Olberic the knight can challenge NPCs to one-on-one duels, knocking them out if he wins. 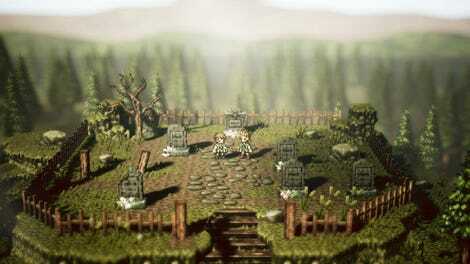 The developers of Octopath Traveler clearly looked to role-playing games of the 1990s for inspiration. I wish they’d taken a closer look at SaGa Frontier, the game that appears to have inspired them most. Whereas that game also told a compilation of unrelated stories (seven instead of eight), it did a far better job, in large part because they all felt different. You’d play one at a time rather than zipping around, and they were diverse enough to avoid too much repetition. Lute’s open world quest to avenge his parents felt drastically different than Red’s linear superhero journey, even though you’d visit many of the same locations, because SaGa Frontier constantly switched up its structure. In Octopath Traveler, all eight stories are so repetitive that they blend together, forming one big bland stew. Octopath Traveler is a beautiful game with one of the best soundtracks I’ve heard. The combat system rocks and will hopefully be used in more Square Enix games to come. There are plenty of good ideas in here. But the game is too grindy, too repetitive, too full of structural problems to be viewed as much more than another botched JRPG experiment.